Open the Console from the Application->Utilities, you will see the log files. From there you can see if it's in ~/Library/Logs or /Library/Logs - you will get crashes and panics and hangs in separate files. Don't forget to look in /private/var/log as well. ~/Library/Logs/DiagnosticReports/ (where ~ refers to your Home directory). ~/Library/Logs/CrashReporter/MobileDevice are the crashlogs for your iOS devices (if any). To find the crash files, you can run Console app which will display all the system messages. If any specific application crashed, look in User Reports. If it's system crash, check in System Reports. 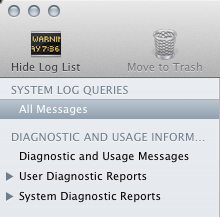 Once you have found the crash file, you can Reveal in Finder (usually located in ~/Library/Logs/DiagnosticReports). If the crash resulted in reboot, in All Messages look line stating its Shutdown Cause and check the following list of Shutdown Causes for further information. Alternatively you can also check the log files in /var/log (such as system.log), or in real-time by log stream. You can also check where dumps are generated by monitoring system.log file, e.g. tail -f /var/log/system.log | grep crash # Hit Control-C to stop. To generate the actual core dump files (in /cores), see: How to generate core dumps in macOS? Use coconutBattery app to check your current battery health. Make sure you didn't modify your boot-args (check by nvram boot-args). Not the answer you're looking for? Browse other questions tagged macos lion mac logs . Safe to post iOS crash logs in public? Cached restored files and their logs after the force shutdown (crash). Where are they? Where does Transmission store logs for called scripts? How to diagnose a crash from system logs? Where are crash logs after a system freeze? Based on what criteria are the crash logs of a process automatically deleted?